The Centers for Disease Control and Prevention has released a document aimed at educating workers about the right way to use nail guns to reduce the risk of injuries. Nail-gun injuries are common, especially in the construction sector, and many of these injuries are catastrophic, resulting in long-term disabilities. Common nail-gun injuries include eye damage such as reduced vision or even blindness. Finger and hand injuries are also common. According to the Centers for Disease Control and Prevention, tens of thousands of nail- gun injuries occur on construction sites every year. Do not carry a nail gun with a finger on the trigger. This could result in a sudden release of the nail, with disastrous consequences. Make sure co-workers are out of your line of fire. Keep your other hand as far from the nail as possible. 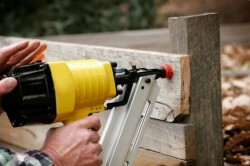 Be extra careful when using the nail gun above your head, standing on a ladder, or using the nail gun in tight spaces. Injuries often occur in these situations. Be ready for the recoil of the nail gun and don’t try to fight it. Operate the nail gun using your dominant hand. Check the lumber before you begin operating the tool. Nails ricochet or deflect because of straps in the lumber.